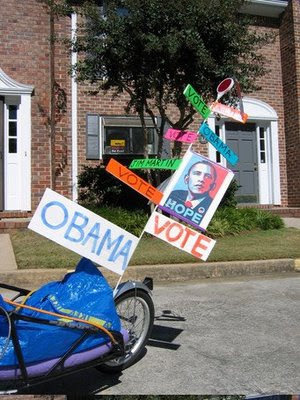 Thanks to the kindness of a stranger - in this case yesterday's generous drive-by donation of Shepard Fairey Obama "Hope" stickers - the Obama Obicycle has been upgraded. Version 2.0 is ready for a test drive this lovely Indian-summer afternoon. It's hard to imagine that admiring Obicycle fans could be more enthusiastic, but we shall see. Yay Uncle Marc! It's so good to hear from you and so good to think of you biking around with Obama as your co-pilot. Keep up the good work. Republicans and Tigers and Pundits, Oh My!